If you want to follow this tutorial step by step, you must first download our starter template, from our repository on GitHub, the starter template, has all files already created, including the images, audio files. Download the starter template. Now let's create our game images. To create an image, we create an instance of the Image() object, using the new keyword. And then we have to set our images source (path), using the src property. Now let's create some variables we will need during the game. 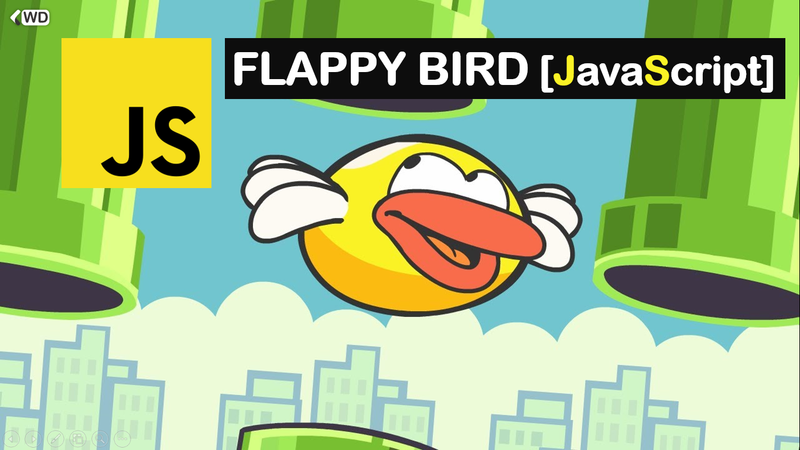 The player can control the bird using any key on the keyboard. We need to add an eventlistener to our document. and when the player press a key, we run a function moveUp(); that will move up the bird by 25px to the top, and also play a sound. We will need to store our pipe (North and South) coordinates, for that, we will use an array. When the game starts, the first pipe X position is at 288px (= cvs.width).